Along a few miles of the Pacific Coast at the Oregon and California border lies a unique area where the ideal combination of climate, soil, water and man has developed a product of deep meaning, beauty and tradition – the Easter Lily. The Harbor-Brookings bench of Southwest Curry County, Oregon and the Smith River area of Northwest Del Norte County, California, is known as the Easter Lily Capital of the World. Here, lily growers toil year-round in their fields to produce nearly all the bulbs from which the large trumpet-shaped flowers bloom. Uniquely suited for the production of superior quality Easter Lily bulbs, the area offers a climate of year-round mild temperatures afforded by a protective bay, deep, rich, alluvial soils and abundant rainfall – the exact measure of ingredients needed to produce a consistently high quality bulb crop. The lily-perfect conditions combined with the ingenuity and dedication of the area’s growers are why over 95% of the world’s potted Easter Lilies originate from this narrow coastal strip. The Easter Lily Capital is accessible only by a narrow and winding coastal highway banked by magnificent Redwood forests, overlooking the spectacularly scenic Pacific Ocean. It seems only fitting that the symbolic flower of Easter, which adds beauty, grace and fragrance to millions of homes, businesses and churches, has its roots in such a pristine and beautiful corner of the world. The Easter Lily — the Latin name is Lilium longiforum – is native to the southern islands of Japan. In the 1880’s, it was widely cultivated in Bermuda and bulbs were shipped to this country. Around the turn of the century, the Japanese took over the annual growing exportation of Easter Lilies to the United States, and continued to dominate the U. S. export market until the start of World War II. A commercial- sized bulb often starts as a small, baby bulblet growing underground on the stem of its mother plant. When the mother plant is harvested, the bulblet is carefully removed and planted in another field. One year later, the bulblet, now called a yearling, is dug up again. The yearling is planted in a new field for another full year of cultivation and specialized care to allow it to grow into its full potential, maturity and status as a commercial bulb. Bulb harvesting takes place each year in the fall, during late September and early October. At harvest time, the lily fields become a bustle of hectic activity as the growers orchestrate a 3-ring circus. Commercial-sized bulbs are dug, cleaned, graded, sorted, packed and cooled. Yearling bulbs are dug, treated and re-planted in newly-prepared fields for the following year’s commercial crop. And, baby bulblets are stripped from the mother plants and tenderly placed in the ground to start them on the road to becoming commercials in 2 or 3 years. The commercial bulbs are shipped to greenhouse growers throughout the United States and Canada who force the plants under controlled conditions to flower in time for Easter. This is a very tricky process since Easter falls on a different day each year, dependent upon celestial bodies. The first Sunday that follows the first full moon after the vernal equinox, Easter can be any day between March 22 and April 25. Crop scheduling and timing is critical – another reason why the bulbs have to be of such a consistent high quality with reliable vigor and performance. The flowers must bloom exactly when they’re supposed to, with no margin for error. The Easter Lily, the traditional time-honored flower of Easter, is highly regarded as a joyful symbol of beauty, hope and life. The large, trumpet-shaped, fragrant white flowers make a meaningful gift that embodies the very essence of the celebration of Easter. Whether you plan to give the potted plants as a gift or use them to decorate your own home, the following tips will help make your Easter Lilies keep on giving. Two of the greatest charms of the Easter Lily are form and fragrance, so look for high quality plants that are aesthetically pleasing from all angles. Select medium-to-compact plants that are well-balanced and proportional in size – not too tall and not too short. When selecting plants, be sure to also cheek out the foliage: an abundance of dark, rich green foliage is not only attractive, but a vital sign of good plant health. The foliage should appear dense and plentiful, all the way down to the soil line, a good indicator of an active, healthy root system. Be wary of Easter Lilies displayed in paper, plastic or mesh sleeves. The protective sleeves are used for shipping and should be removed immediately upon arrival at the store. While the packaging may seem convenient, the quality of the plants will deteriorate if they are left sleeved too long. Also avoid waterlogged plants, especially if the plant looks wilted. This could be a sign of root rot. In the home, Easter Lilies prefer moderately cool temperatures. Recommended daytime temperatures are 60o to 65o F. with slightly cooler night temperatures. Avoid placing plants near drafts, and avoid exposure to excess heat or dry air from appliances, fireplaces or heating ducts. The lily will thrive near a window in bright, indirect natural daylight, but avoid glaring, direct sunlight. Easter Lilies prefer moderately moist, well-drained soil. Water the plant thoroughly when the soil surface feels dry to a light touch, but avoid over-watering. If the pot is wrapped in decorative foil, be careful not to let the plant sit in trapped, standing water. For best results, remove the plant from decorative pots or covers, take it over the sink and water thoroughly until water seeps out of the pot’s drain holes to completely saturate the soil. Allow the plant to air for a few minutes and discard the excess water before replacing it back into its decorative pot cover. After the last bloom has withered and has been cut away, you can continue to grow your Easter Lilies, and even plant them outside in your garden to enjoy them for years to come. Once the lilies have finished flowering, place the potted plants in a sunny location. Continue to water thoroughly as needed, and add one teaspoon of slow-release Osmocote fertilizer every 6 weeks. You can move the pots to a sunny location outdoors after the danger of frost has passed. Another planting tip to consider is that lilies like their roots in shade and their heads in the sun. Mulching helps conserve moisture in between waterings, keeps the soil cool and loose, and provides a fluffy, nutritious medium for the stem roots. Or, a more attractive alternative would be to plant a “living mulch,” or a low ground cover of shallow-rooted, complementary annuals or perennials. The stately Easter Lilies rising above lacy violas or primulas is not only aesthetically pleasing, but also sound gardening. This succulent is native to South Africa. I received this plant as a gift several years ago and have managed to keep it alive and, apparently, thriving. For the first few years it was kept outside and brought in when the night temperatures. Recently I have been keeping it indoors throughout the year. It is a fairly forgiving plant. Moderate amounts of a balanced fertilizer and water. Overwatering will lead to root rot and be the end of the plant. Make sure is doesn’t dry out for too long. It must be one of the easiest plants to propagate. Even leaves that drop off will root in soil. 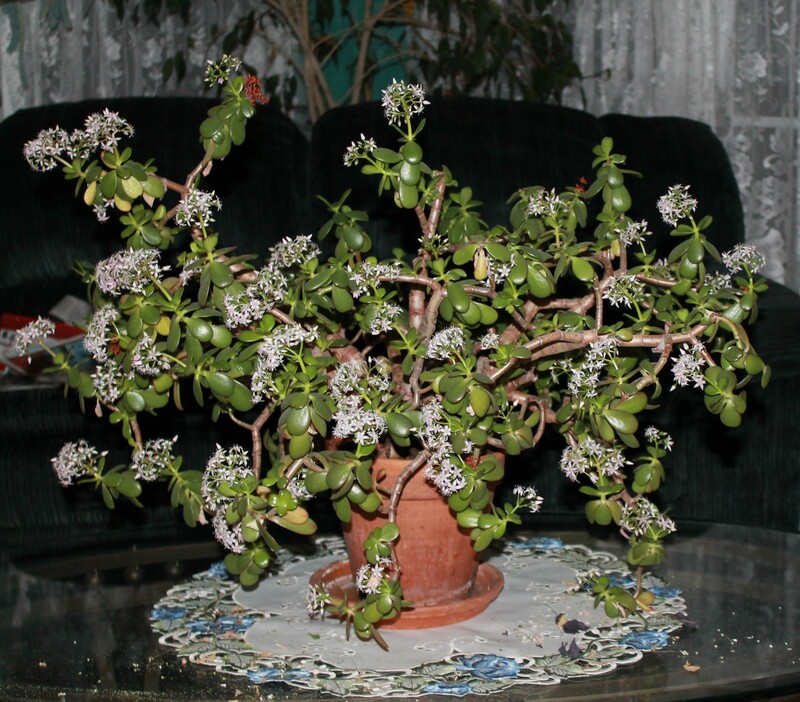 The branches of the jade plant are fragile. Be careful when moving or working around the plants. If branches break off, just put them in some potting soil and you have a new plant. According to the literature, getting a jade to bloom is a daunting task. Withhold water and fertilizer in the fall and early winter. Keep the plant and cool temperatures and limit light to 4 hours. COMPLETE darkness for 20 hours. I have never done this. My jade is kept in a south facing kitchen window all year. It starts blooming around Christmas and will continue to bloom for a couple months. I believe that is it the decreasing amount of daylight and a day/night temperature change are what cause the plant to but on a display. On March 17, we’re all Irish! As we move into March, our thoughts turn to spring and gardens and gardening. For those of us living in the north, we can break out the green in mid-March by celebrating St. Patrick’s Day, whether or not we’re Irish. The ubiquitous symbol of the holiday — the shamrock — appears on clothing, signs, flags, and has been the inspiration for the color and name of the milkshakes that appear at McDonald’s this time of year. It made me wonder, though: what is a shamrock? Turns out that a shamrock is really just clover. Shamrock usually refers to either the species Trifolium dubium (lesser clover, Irish: seamair bhuí) or Trifolium repens (white clover, Irish: seamair bhán). However, other three-leaved plants—such as Medicago lupulina, Trifolium pratense, and Oxalis acetosella—are sometimes called shamrocks or clovers. There is no consensus as to the species of clover that is considered the “true” shamrock. The humble little plant has quite the history in Ireland and is mentioned in literature as far back as 1571 as a plant eaten by the Irish. By the end of the sixteenth century the shamrock had become known to English writers as a plant particularly associated with the Irish, but only with a confused notion that the shamrock was a plant eaten by them. The shamrock was chosen Ireland’s national emblem because of the legend that St. Patrick had used it to illustrate the doctrine of the Trinity. The Trinity is the idea that God is really three-in-one: The Father, The Son and The Holy Spirit. According to the legend, Patrick demonstrated the meaning of the Three-in-One by picking a shamrock from the grass growing at his feet and showing it to his listeners. He told them that just as the shamrock is one leaf with three parts, God is one entity with three Persons. Another St. Patrick myth is the claim that he banished snakes from Ireland. It’s true no snakes exist on the island today, but they never did. Ireland, after all, is surrounded by icy ocean waters—much too cold to allow snakes to migrate from Britain or anywhere else. But since snakes often represent evil in literature, “when Patrick drives the snakes out of Ireland, it is symbolically saying he drove the old, evil, pagan ways out of Ireland [and] brought in a new age,” says classics professor Philip Freeman of Luther College in Iowa. The snakes myth and others—such as Patrick using three-leafed shamrocks to explain the Holy Trinity (Father, Son, and Holy Ghost)—were likely spread by well-meaning monks centuries after St. Patrick’s death, Freeman said. Until the 1970s, St. Patrick’s Day in Ireland was a minor religious holiday. A priest would acknowledge the feast day, and families would celebrate with a big meal, but that was about it. “St. Patrick’s Day was basically invented in America by Irish-Americans,” Freeman said. Eighteenth-century Irish soldiers fighting with the British in the U.S. Revolutionary War held the first St. Patrick’s Day parades. Some soldiers, for example, marched through New York City in 1762 to reconnect with their Irish roots. Other parades followed in the years and decades after, including well-known celebrations in Boston, Philadelphia, and Chicago, primarily for flourishing Irish immigrant communities. Timothy Meagher is an expert on Irish-American history at Catholic University in Washington, D.C. In the 19th century, as St. Patrick’s Day parades were flourishing, wearing the color green became a show of commitment to Ireland, Meagher said. In 1962 the show of solidarity took a spectacular turn in Chicago when the city decided to dye a portion of the Chicago River green. The tradition started when parade organizer Steve Bailey, head of a plumbers’ union, noticed how a dye used to detect river pollution had stained a colleague’s overalls a brilliant green, according to greenchicagoriver.com. Why not, Bailey thought, turn the river green on St. Patrick’s Day? So began the tradition. The environmental impact of the dye is minimal compared with sources of pollution such as bacteria from sewage-treatment plants, said Margaret Frisbie, the executive director of the advocacy group Friends of the Chicago River. Her group focuses instead on turning the Chicago River into a welcoming habitat full of fish, herons, turtles, and beavers. If the river becomes a wildlife haven, the thinking goes, Chicagoans won’t want to dye their river green.”Our hope is that, as the river continues to improve, ultimately people can get excited about celebrating St. Patrick’s Day different ways,” she said. Do you have a nice, sunny spot in your garden that is calling for color? Coneflowers look gorgeous in nearly any style of garden. For a relaxed, meadow-inspired look, combine coneflowers with grasses, spike blazing star and goldenrod. Wis py grasses create a contrasting backdrop for bold coneflowers. They’re also surprisingly adaptable in containers, but they’re usually won’t get as big as they do in the ground. Tucking a few coneflowers into containers is a great way to entice butterflies near a deck or patio. 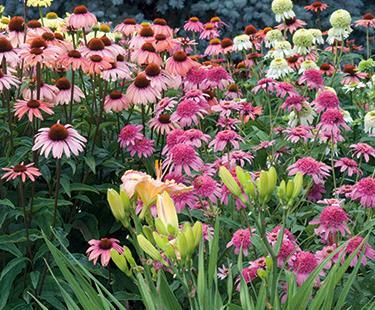 When it comes to the old-fashioned pink-purple or white coneflower, there isn’t an easier plant to grow. As long as you put the plant in the ground the right side up, it should be fine! Coneflowers like plenty of sun and average, well-drained soil. Like any perennial, you’ll want to water new plants the first summer, to get them safely established. After that, they’ll be virtually carefree! Pick a good site. 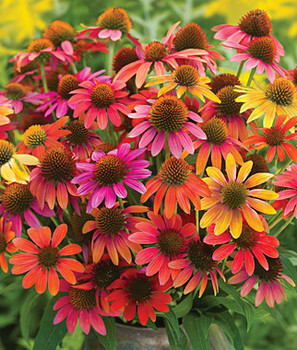 While the old-fashioned purple coneflowers will grow almost anywhere, the yellow, red, and orange ones need full sun and rich, moist, well-drained soil. Adding some compost to the bed before you plant will make them happier, too. Buy the biggest plants you can find. This is no time to cut corners! Choose plants with multiple growing points, not just one cluster of leaves. Don’t let it bloom the first year. Heartbreaking, right? But the plant will establish healthier roots if it’s not putting energy into flowers the first year. Plants in quart- or gallon-size containers won’t need this if their root systems have had a chance to grow to fill the pot. But if you’re working with plants in small 4- or 6-in. wide pots, it’s best to either pinch the blooms off or cut the entire bloom stalk back. Be sure to mulch. If you garden where the ground repeatedly freezes and thaws during the winter, mulch over the plant with a 6-in. layer of chopped leaves to protect the crown. 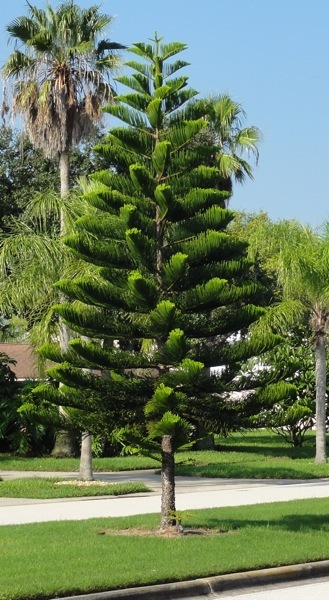 I was on a vacation in Florida recently and enjoyed, once again, seeing my favorite tree in an environment where it could really stand out: the Norfolk Island Pine. Where we live in the north, the Norfolk Island Pine is a wonderful potted plant that is particularly popular at Christmas (decorated with glitter and miniature ornaments), but cannot survive as a true tree outdoors. It is native to Norfolk Island, located between New Zealand and Australia. The tree grows 200 feet tall in its natural habitat, but rarely exceeds 6-8 feet tall as a houseplant. While this conifer is a true evergreen, it is not a pine. Indoor care requires that the soil be kept evenly moist. If the soil dries out or if the humidity level is too low, the bottom branches will turn brown and fall off. [This is, sadly, the fate of the Norfolk Island Pine that I had as a houseplant for many years. Unfortunately, 2015 was the year of it’s demise.] Keep the plant on a tray of pebbles with water to maintain the necessary level of humidity. 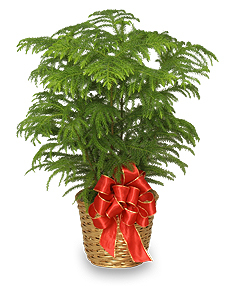 Norfolk Island Pine as a popular houseplant plantDry, hot air — common in the winter where we live — also makes this plant a magnet for spider mites. If possible, try to keep it in a cooler room, away from heat vents. Unfortunately, no matter how beautiful and healthy the plant may be, it will never match the majesty of those dark green fronds rising straight up through the field of palm trees in Florida and parts of the Caribbean — which means that I’ll just have to keep going on vacations! I confess, I’m not much of a vegetable gardener. I much prefer the delicate beauty of flowers and using them to design a stunning landscape. For some reason, a pepper plant swaying in the breeze doesn’t bring me the same delight as that of the tender blossom of a bleeding heart or daffodil. But then there is the tomato… Yes, I know, to the true botanists out there it’s not technically a vegetable, but a fruit. Although, in 1887, the U.S. Supreme Court did apparently rule that it was indeed a vegetable. So legally, it seems, the tomato is not a fruit. Ah, but I digress. For me, it’s not the most attractive of garden plants, so that’s not why I cherish it so much. And it’s not so much that I even like the taste of tomatoes. I would much prefer a freshly pulled carrot after wiping the dirt off on my sleeve, or those sweet sugar snap peas plucked right from the vine. Yes, my love of the tomato runs deeper than my taste buds. My love of the tomato is because of love itself. His name was Louie… a larger than life character. I remember visiting his house in early spring and walking through the narrow pathways formed in his garage that hadn’t seen a car in years. Every possible space was filled with flats of seedlings. There were many kinds of plants that he intended to later sell out of the back of his rusty Volkswagen van at a nearby parking lot. The crudely written price signs drawn with a grease pencil on a sheet of notebook paper were his only marketing tool. But his plants were legendary, and his pride and joy were his tomatoes: Early Girl, Jet Star, Beefsteak, Giant Pinks, and the list went on. He could tell you the unique characteristics of each variety – its flavor, color, shape, texture and size. I remembered his own small plot of land where he grew tomatoes that looked like something out of the Little Shop of Horrors. They were immense, with plants reaching the eaves of his house and tomatoes the size of musk melons. The tomato… When I pluck that first one from the vine I get an immense sense of satisfaction and nostalgia as I think of Louie. That’s why gardening is so much more than a laborious task of weeding and pest control to me. Gardening for me is about relationships. Yes, much of my time in the garden is spent alone. But even in solitude I’m reminded of relationships – I can look at a plant and tell you who gave me a cutting of it, who I was with when I got it, who helped me plant it… As I look at the birds and butterflies I enjoy my relationship with nature and the one who created it all. And the lowly tomato – I can’t look at one without being reminded of my relationship with Louie, whom some may have considered a lowly old man himself, but whose wisdom and beauty brought unbelievable flavor to my life. Those are the things that make gardening so meaningful and enjoyable for me. Those are the things of life. 5. Plant the seedlings deep! 10. A little salt and pepper on a slice of Giant Pink – nothing better!